Posted on 01 June 2018. ST. GEORGE’S, Grenada, CMC –The Antigua and Barbuda government Wednesday urged regional governments to provide a subvention to the cash-strapped regional airline, LIAT, so as to ensure its future viability. 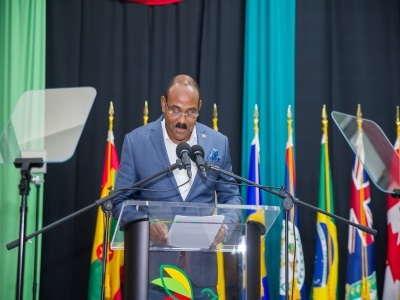 Prime Minister Gaston Browne, addressing a seminar on “Air transport Competitiveness and Connectivity” told delegates that the time has come for the Antigua-based airline to receive a subvention from the governments of the sub-regional Organisation of Eastern Caribbean States (OECS) and Barbados. “In essence LIAT need fresh cash,” he told the seminar that forms part of the 48th annual general meeting of the board of governors of the Barbados-based Caribbean Development Bank (CDB) that ends here on Thursday. “We have to see subsidising as an investment, an investment in the region to ensure the integration process works,” Browne said, while pointing out that in other regions of the world some airlines are profitable because of subvention from the state. LIAT main shareholders are the governments of Antigua and Barbuda, Barbados, Dominica and St. Vincent and the Grenadines. Other regional governments have in the past been reluctant to provide funds to the airline that operates a scheduled serving 17 destinations in the Caribbean. The airline has in the past hinted at cutting services to some of the unprofitable routes. In his address, Browne, in providing justification for what he describes as a solution to the LIAT problem, said that the airline should receive the same courtesy that other international airlines receives when they decide to put some destinations on their routes on behalf of some Caribbean states. “I find it extremely interesting that our governments will contribute to campaigns of other airlines in millions of dollars but not in an institution as LIAT which is so critical for its role in our economic sustainability, some government find every reason why they ought not to contribute,” he said. “When we look at other countries some airlines are profitable, but they are subsidised by the state, we should all come together and provide some subvention for LIAT, that structure itself will render LIAT more profitable,” he said. Browne also proposed a reduction and or complete removal of airport taxes because he said it is hindering travel within the islands. “The size of the market of the region is small, we have small population and these taxes increase cost and so if a reliable air transport is essential to Caribbean economies we need to encourage more movement by reducing on the cost of travel,” he said. “The time has come for us to reform and be proactive in our strategies, we have hurt ourselves by introducing all these travel taxes” Browne told the meeting.